Bonefish feed on the bottom, burying their snouts in the sand or silt. While feeding on very shallow flats their wavering tails are often visible out of the water. In deeper water their tails are not visible but the fish can still be seen. While bonefish are feeding, the condition of the surface of the water affects their feeling of security. Bonefish can be more nervous in very calm water. Conditions will determine how best to present the fly. On most days there is a slight chop or ripple on the surface and the fly must be presented three to five feet in front of them. On very still days the fly should be cast further from the fish and stripped back into his area of awareness. During the warmer months very large schools of bonefish will often back off the shoreline into about 5 to 10 feet of cooler water. As they grub for food they stir up the bottom creating a visible cloud of mud, referred to as “milk”. This cloud of mud moves as the bonefish move and makes these bones feel quite secure because they are not visible to predators. Often the angler can catch one fish after another without spooking the school. It is generally not our practice to fish muds because the desired challenge of sight fishing is eliminated. However, we will fish muds with you at your request. Traveling bonefish are intent on changing location but are very aware of their surroundings and not necessarily interested in feeding. When casting to traveling bonefish place your offering well ahead of the fish and let it settle. Your guide will tell you when the fish is in range and when to strip. On the flats, your guide will be standing on the poling tower poling the boat while scanning for fish. You will be standing, waiting, on the front deck of the boat with your rod in one hand and your fly in the other. You can allow some line to trail in the water but don’t have more line in the water than you can comfortably pick up to cast. Except for barracuda or big tarpon lying on the bottom, fish are always moving. Scan laterally, slowly, as the boat moves. Look for the flash of an exposed tail, nervous water, a bulge, wave or push on top of the water, or the shadow of a cruising fish. Do not cast until your guide asks you to. He will put the boat in position for the cast, getting every one on board out of the way of your fly. He will tell you how far to cast, in which direction (referencing the dial of a clock) and tell you of the movement of the fish. Listen to your guide and cast even if you don’t see the fish to take advantage of every opportunity. When casting to a fish that is moving towards you always pull your fly away from the fish — never toward it. You will occasionally cast to fish that are moving away from you. In that instance you will want to put your fly in front of the fish and strip back to it. Allow the fly to settle on the bottom and strip it off of the bottom with long, slow strips. If the fish sees the fly, he will pick it up from a dead stop. The fish will usually pop its tail up as it takes the fly and the hook should be set immediately. Your guide will see the fish pick up the fly before you feel it. Many bonefish turn violently at the moment they feel the hook. It is important to set the hook with a long slow strip. Too much pressure can snap the leader as the fish begins to run. When the fish is on and running, make sure your fly line is clear and slowly raise your rod. Occasionally the fish will run toward you, in which case you will have to quickly strip in more line to maintain pressure. Then the fish will change direction and you can clear the line. 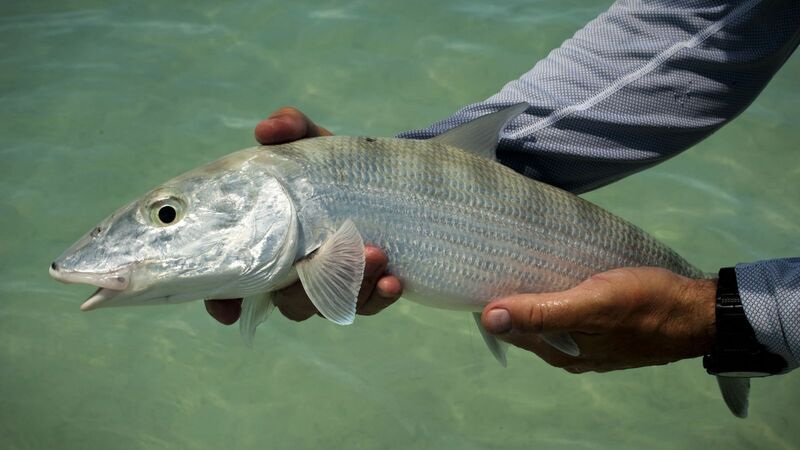 Bonefish have tough mouths and having very sharp hooks is important. Re-sharpen hooks with a hook hone after every three or four fish. If you have refusals change flies or make sure there is no unwanted scent (as from sunscreen on your hands) on the fly by allowing your guide to rub mud from the bottom on your fly. Your guides will have their favorite flies, and you should rely upon them for fly suggestions. However, if you have a fly you would like to use, do not be afraid to experiment. We encourage you to pinch down the barbs on the hooks of your flies with long-nosed pliers. This makes it easier to release fish unharmed, and many people feel the barbless hook actually more easily penetrates the tough tissue of the bonefish’s mouth. Most importantly, you minimize the risk of injury to yourself and others should a backcast end up somewhere it does not belong. Bonefish evolved their incredible burst speed to avoid being eaten by predators. Since they are the favorite food of sharks and barracuda it is very important to release them in good condition and give them a chance to survive. We do not recommend ultra light leaders and long fights with loose drags that tire the fish excessively. Leader should not be lighter than 10 lb and we recommend 12 and even 16 lb leaders. For photographs, please revive the fish before removing it from the water for the photograph and please keep the fish out of the water for as short a time as possible. Handle the fish with clean, wet hands as little as possible. Please allow your guide to take the time to revive the fish before releasing. You can purchase most of the bonefish flies you will need in our fly shop. 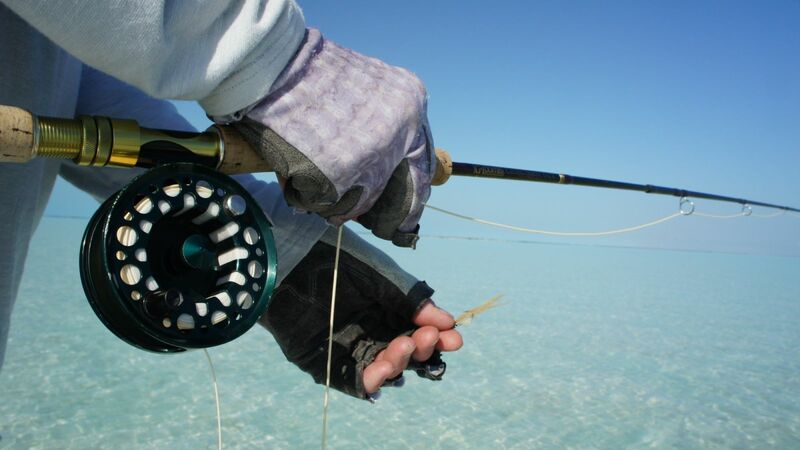 Mangrove Cay Club carries flies in the most often used patterns and sizes for our location. Some patterns have been designed by Mangrove Cay Club guides and are custom tied for us. We like variations of Gotchas and Charlies including red heads and gold tails. In most conditions you will want to use flies in size 2 and 4. We almost always fish with bead chain eyes but suggest you bring a few with small lead eyes with you. Spin fishing for bonefish can be very effective when done correctly. The most important thing to remember is that the presentation of bait or a lure is not as delicate as that of a fly. When presenting your lure, it is best to cast 10 to 15 feet (3 to 4.5 m) in front of the fish. When the fish reaches the vicinity of the lure, begin a slow retrieve.